OK, so this has been a long-time promised and an long-time coming. Here's an overview of my most recent work/changes to the printer. The other major change I made was the enclosure. This was prompted from the difficulty I was having with some larger ABS prints. I was having a terrible time with warping and lift. I built it from 2 IKEA Lack end tables ($7.99 ea.) I only used the top of the 2nd one for the base. I had to add some spacers to the bottom of the legs to make it tall enough for the printer with the Z-Motor stand-offs. A stock FT 2020 would probably fit fine. I then purchased 3/16 plywood for the sides, covering them in shelf liner, and screwing them to the sides and back. Once these were attached, the rigidity of the whole thing is incredible. The front of the enclosure is a piece of acrylic, held on with cabinet magnets. I have a couple alignment L's I printed, that I set the bottom of the door on, then snap it into place. It works very well. Having it enclosed resulted in much better results with ABS. I am very pleased. The pics below show the whole thing, the front door alignment brackets/magnets, and how I store the front door when accessing the printer, or when printing PLA. There are clips I printed that it rests in on the side of the printer. The Star Fleet and Rebel logos you see on the door were added to cover the tips of the screws that hold the magnet plates to the door. They were too long, so I printed these parts to screw onto them. They kind of act like nuts, and also give a little personal flair to the front. (wish I had printed them in different colors, though). I have more than 10 photos, so part 2 coming soon! Edited 1 time(s). Last edit at 08/18/2016 01:09PM by iamquestar. Many of the V-Slot parts I printed, I did out of PLA. I will not be able to experiment with an enclosure heater until I replace all of them with ABS. That's a huge job, so I will probably stick with just being able to keep the temp within the enclosure up around the 45c mark at this point. The other major items of note are running the printer with OctoPrint on a Raspberry Pi, and being able to control the printer's and LED's power from the Pi using a relay module. I must say that playing with all of this has been a lot of fun. (and frustrating at times too). DISCLAIMER: Make sure you know what you are doing, both with the Pi, and with the relay board and associated wiring. If you use this to control the power to your printer, you are playing with mains power. If you mess up, you could hurt yourself, your printer, set a fire, or even electrocute yourself (you could die). These instructions are only intended for theoretical purposes. Anyone attempting this setup should confirm all steps with a qualified professional. I found a 10 pin to 10 pin connector on an old computer that was used to connect the front USB ports to the MB. This was perfect for connecting the Pi to the Relay module. Just prying up the locking tab on the connector allowed me to re-arrange the wires as needed. I used a 2 and a 3 pin connector (from other computer case cables) for connecting on the relay board. Pin 2 on the Raspberry Pi is 5v, so this attached to VCC on the relay board. Pin 6 on the Pi is a ground, so this attaches to the GND on the relay board. Pins 3 and 7 are GPIO pins, and these attach to the In 3 and In 4 on the relay board. You'll then need to wire in the things you'll be switching with the relays. I am using it for Printer Power and the LEDs. For controlling printer, the power cable comes from the switch, the Neutral and Ground are hooked up directly to the Power Supply, and the line (or hot) is run to the relay, then from the relay to the power supply. Now the relay acts as a switch for the power supply. For the LEDs, I am powering those from the FT power supply. So I have a line from the -12v on the Power supply to the -12v pad on the LED strip. Then I go from the Power Supply +12v to the relay, then from the relay to the +12v pad on the LED strip, so the relay will now switch the +12v for the LEDs. Note that by running the LED's from the Printer Power Supply, the printer must be on, for the LED's to work. To change this, you would have to have a separate power supply for the LED's, and you would hook that up similarly as the printer power. These last 2 pictures show the various items mounted to the top of the enclosure. Things/wiring are still a bit of a mess. I will soon have all of that wrapped and secured so it all looks ship-shape. I still haven't decided what I will do with the display. I just recently got longer cables, so I have a lot more flexibility in mounting it. I'll get that figured out soon. The filament feeds through a teflon tube down through the top of the enclosure. It works very well. I hope that all of these explanations were clear, and helpful to some of you. If you have any questions, or need any help, please let me know, I'm happy to assist as I can. I am by no means an expert, and am learning like most of you. I try to check this thread every day, but at times I may be away for a few days. I will respond to questions as soon as I can. Looks great Andrew! getting lost of ideals. Great work! I like the motor/extruder mount. The stock cantilevered motor setup always bothered me, having it over the x-rail seems more balanced. FYI, your amazon link to the sensor goes to the RaspPi kit instead. I moved on from the Folger to an Eclips3D CoreXY. It's better and faster, but it still makes me aware of what a good printer the Folger 2020 is. The key, as with the Eclips3D, is a really rigid frame - get that right and many other things become easier. I've got my eye on the d-bot http://www.thingiverse.com/thing:1001065. After changing the Folger 2020 to v-slot rails for the x and y axes, I like the idea of the v-slots over the smooth rods. Although the oil-free bushings for the linear bearings are probably much better than the roller ball linear bearings in the Folger kits, so my hangup might be a bit unfounded. The Dbot is definitely worth thinking about. The designer of the Eclips3D also has a new design he is working on which will use linear guides. @ iamquestar - While back do I remember correctly you were waiting on a 120V heated bed, or was that someone else? Jbed?ust ordered parts to go up to a 200mm x 300m bed. With the parts I take out of the FT I also want to increase Z as much as I can. Any recommendations on a bed? How do I get rid of the waves in the outside layers? Edited 1 time(s). Last edit at 08/18/2016 04:49PM by jabu32. Looks like your extruder driver current is a little high. Check the Vref. You probably want to reduce the current on all of the steppers, they tend to run a little hot. Here is a print where i lowered the voltage on the motors. This is a hollow cube. you can see it looks good at the base where it is solid fill. then starts to look like crap once it starts building just the walls. a little higher and you can see where i lowered the voltages. Edited 1 time(s). Last edit at 08/19/2016 10:03AM by jabu32. Has anyone on here ran the 12864 lcd controller with sucess on the folger tech prusa i3? Ive been trying for the past 6 hrs with little to no luck .....is there a trick to this?? Despite following instructions i wasnt able to get the screen to work. When i downloaded the latest marlin and followed instructions on modifying the code for sd support and the #define REPRAP_DISCOUNT_FULL_GRAPHIC_SMART_CONTROLLER the screen worked but i nearly busted the printer . It would try to home in the x and y axies and ram into the end stops and not stop. When i tried running the printer with a computer and repetier and no lcd panel i lost my heated bed function. I ended up loading the old marlin firmware and recovered the heat bed function on repetier using a pc. Is there a guide on properly configuring this lcd so the printer works properly? Oh, now come on... This is not going to help my budget at all! Before looking at these, I was perfectly happy to keep my next printer "out in the future" somewhere, maybe toward the end of the year, but now... I just spent some time looking over the design of both of those printers, and I really want to move forward NOW! Animoose, how do you like smoothieware on the Eclips3D? How much do you think that effects quality? I've seen the marketing claims... "faster calculations and look-ahead acceleration adjustments make for smoother movement..." but how does that translate in the real world? Anything you've noticed? Edited 1 time(s). Last edit at 08/19/2016 12:46PM by iamquestar. Edited 1 time(s). Last edit at 08/19/2016 12:47PM by iamquestar. I am printing blue PLA. nozzle 210deg Bed 70deg and no cooling fan on the part. The bottom couple mm of the part is darker than the rest and is squeezed out like the part is melting. Printing on blue tape and it is almost impossible to get the part off the bed when complete. 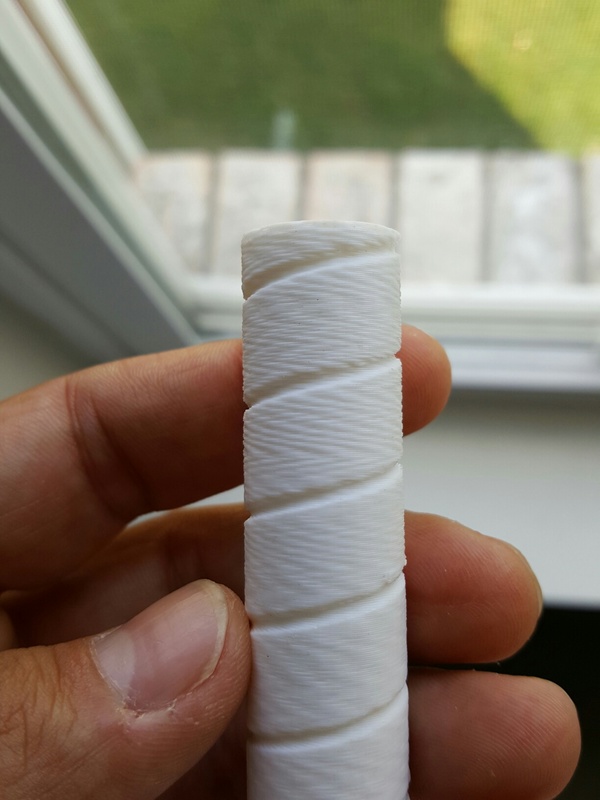 Is it a bed temp problem, nozzle offset or first layer settings? Can not seem to find the right combination. Rest of the part looks fine and the dimensions are good. I can do a fairly close comparison of using smoothieware, as I initially set up the Eclips3D with a RAMPS board. I later changed it to an Azteeg X5 V3 with 1/32 steppers. It definitely is much smoother and quieter, and it is more accurate on sharp corners. Some of this is due to the 1/32 rather than 1/16 steppers, and some may be due to the acceleration planning in Smoothieware. I haven't moved to the latest release which is said to have even more accurate planning. I also tried the MKS SBASE board, which is another smoothieware compatible board. I never got it to work, and had a hostile and unco-operative response from the vendor. Spend the extra $50 and get the Azteeg. I had some difficulties getting my PC to talk to both boards. It kept timing out over USB. The smoothieware people tried to solve this but were in the end not very helpful (suggesting I switch to Linux, and also spending time saying that Repetier Host was no good, when I had established that the problem appeared in other situations). I never got the bottom of this, but suspect it is a problem with some specific combination of drivers on my Dell PC. In the end, I settled on a configuration where I have a Raspberry Pi connected to the board, and then run Rep Server on the pi and Rep Host on the PC. I also tried controlling it over Ethernet and this works with Pronterface but not with Rep Host. Too hot on the extruder can cause removal problems as well. It definitely is a balancing act. With the stock setup, I was printing FT PLA at 195c. Initilly my bed thermistor was bad, so I was printing without heat, and it worked fine for PLA. Try dropping both temps, and see what happens. Then, try raising the height of your hot end a little, and see if that helps your over-adhesion. Hopefully one of these steps will help. Ditto on the comments that iamquestar made about your temps. My PLA bed temp starts at 80 for the first layer and then drops to 55 (I had trouble initially getting PLA to stick, and that first layer bed temp worked for me). I use glue stick on the glass instead of blue tape, and PLA parts are sometimes stuck pretty well. Putting the glass bed in the freezer for a minute makes it pop right off, or I use a razor blade to get under one edge, then it pops off. Thanks guys, after studying the first layers and lowering the temps i see a large improvement. Found some of my problem is the nozzle. When I was digging in the bed I used up all my spares. This one is making a ragged first layer. Be down till Tue waiting on Amazon. Hey, is anyone else having problems with the FT 2004 LCD display? Mine just shows gibberish (I have attached a picture), and I can't figure out if the display is defective, if it's a problem with my firmware, or if it's something completely different. It is a firmware issue. I had the same problem with that display in marlin. I switched over to repetier since i could not figure it out. My cooling fan doesnt spin up at 50% (It does if I manually spart spinning it). Is there any way in the firmware to peg it at 100% 24/7? This is a print cooling fan - Not the extruder hetsink fan. Edited 1 time(s). Last edit at 08/22/2016 05:35AM by Mach. No. If you want it to be at 100% all the time, set the both the min and max fan speed to 100% in your slicer. Did you load the U8glib library? I had a couple versions of Marlin do this on me. When I found the correct version the display worked without having to make any setting changes or turning anything on. I tried loading the U8glib library, but it didn't change anything. I thought the U8glib library was only for the full graphics LCDs. Which version of Marlin are you using? I am currently running Marlin 1.0.2-1.